The apartment has a separate bedroom with terrace and garden access. She has a full kitchen with a dining room, which adjoins the living area. Here is a sofa bed for 2 more persons is available. A flat screen TV and an audio system in the living area are available. Fitted wardrobes and a storage room provide ample storage. A sauna completes the comfort factor of this apartment. To cool (and not only for it) is a bathroom with shower and toilet. 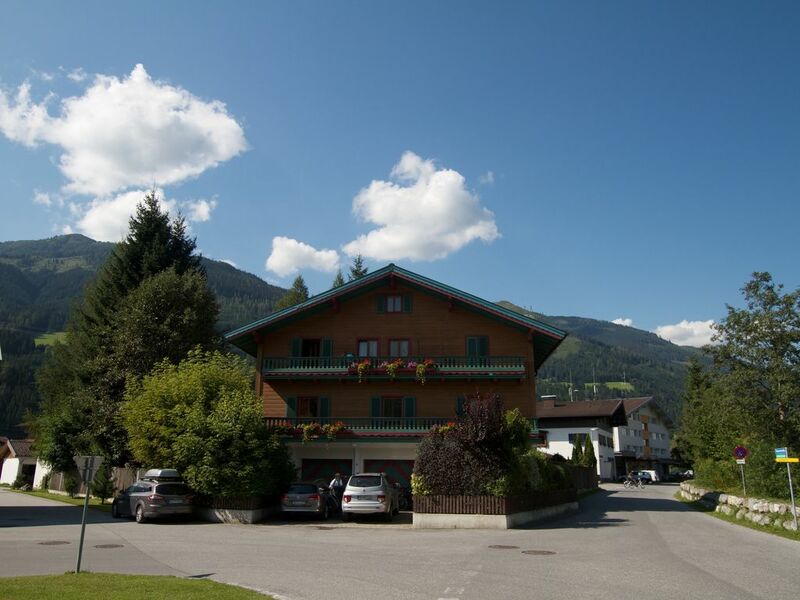 The country house 'Zell am See' consists of 3 apartments; 'Sauna' in the ground floor, 'Fireplace' in the 1st. OG and 'Panorama' in 2. Upper floor with approx. 70 or 100 sqm living space in tastefully furnished country house ambience. All apartments have a terrace or Balcony and a garden that can be used by all residents. There are each 4 sleep possibilities (or up to 6 in the panoramic apartment) available as well as a full kitchen, a living room and at least one bathroom, with some bedrooms z. T. have separate bathrooms. The lower apartment includes a sauna; the middle one fireplace and a tiled stove. For the summer tourists are beautiful hiking and cycling opportunities from easy to difficult in the immediate vicinity. Also located is a beautifully landscaped lake in walking distance. For the winter tourists resulting from the good location diverse opportunities. Within short rail or By car you can reach the lifts in the Kitzbüheler Alpen (near Hollersbach) and the ski areas Zell am See / Kaprun / Kitzsteinhorn and Saalbach-Hinterglemm / Leogang. We loved everything about this property and will recommend it to our friends too. I am delighted that you enjoyed your holidays in my holiday home and can take a lot of beautiful memories to take home. Thank you again for your visit. Thank you for rating your stay in my apartment, and hope to welcome you again soon. Wir hatten Anfang August 2015 die Sauna Wohnung, die im mediterranem Stil gehalten ist, gebucht. Eine sehr schöne Wohnung mit einer schönen Terrasse mit Zugang sowohl vom Schlafzimmer, als auch vom Wohnzimmer. Alles sauber und gepflegt. Vielen herzlichen Dank für die tolle Bewertung!!!! Die Ferienwohnung ist sehr schön und Kaprun und Zell am See sind gut zu erreichen. Wir hatten einen schönen Skiurlaub. The municipality of Niedernsill is located in one of the most beautiful areas of Austria, at the foot of the Hohe Tauern National Park. Skiers, recreation seekers, mountaineers, hikers, mountain bikers, athletes and those interested in culture feel comfortable in the wooded mountains of the Oberpinzgau. Tearing streams, lush meadows, exciting trails, unlimited skiing and rushing forests invite the guest to a holiday as he wishes. Winter sports enthusiasts can reach the ski areas Zell am See - Kaprun (Schmitten, Maiskogel, Kitzsteinhorn), Kitzbüheler Alpen - Kirchberg and Saalbach-Hinterglemm / Leogang within a short time by car, train or ski bus.